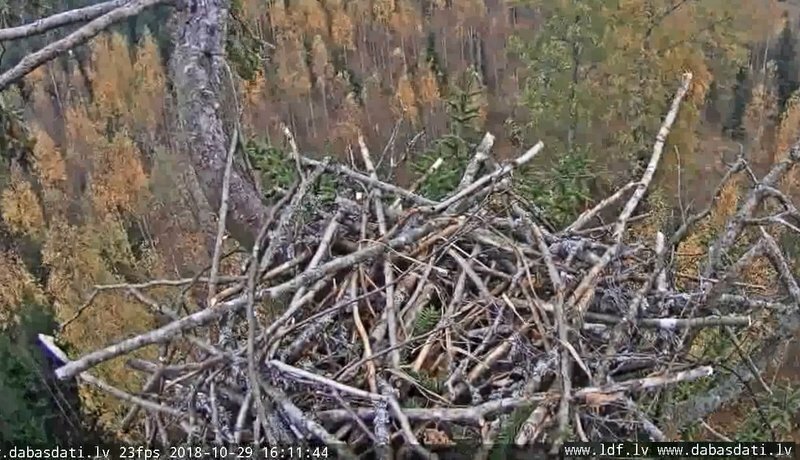 the camera has worked for a while but stopped at 11:18.
the nest yesterday at 16:11.
this morning at 10:56 the sticks are in the same order. Sonchik, you made the same comparison. the surrounding trees can also be seen in your pictures. 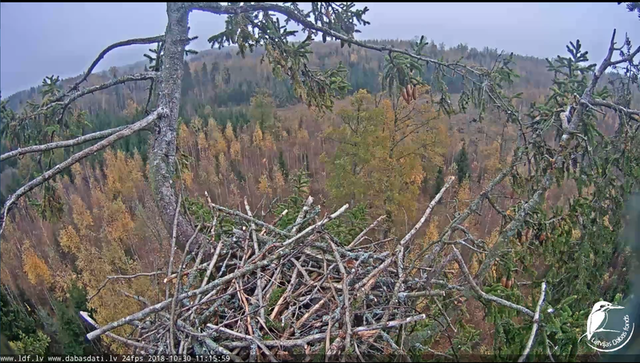 i think that the birches are already naked. the other trees which still have leaves are probably oaks. About the guest with a ring. 12:06 the camera woke up again. 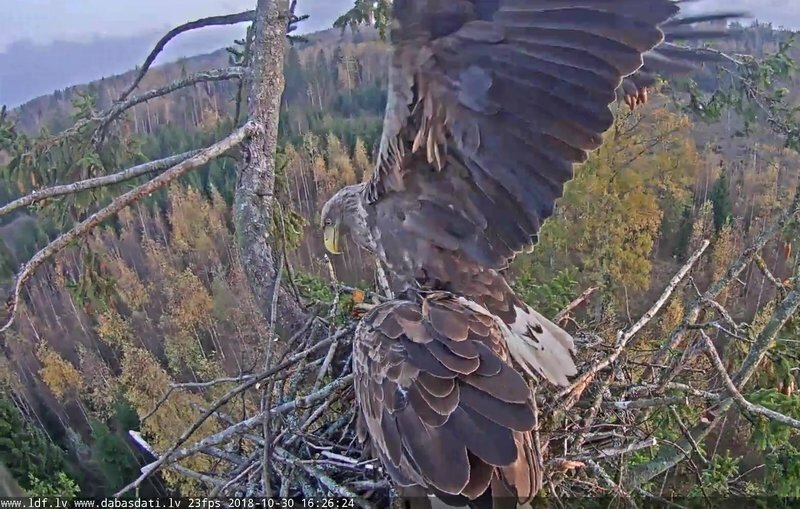 "This is H491, I ring it as the only baby in a nest in SW Kurzeme on May 29, 2017. For this I wrote to Marim just now, when I was looking at the speed at which I made a mistake in the year - I wrote to Marim that the bird was circled this year, but in fact it was ringed last year. I also add a picture in the bird's nest just after the ring." 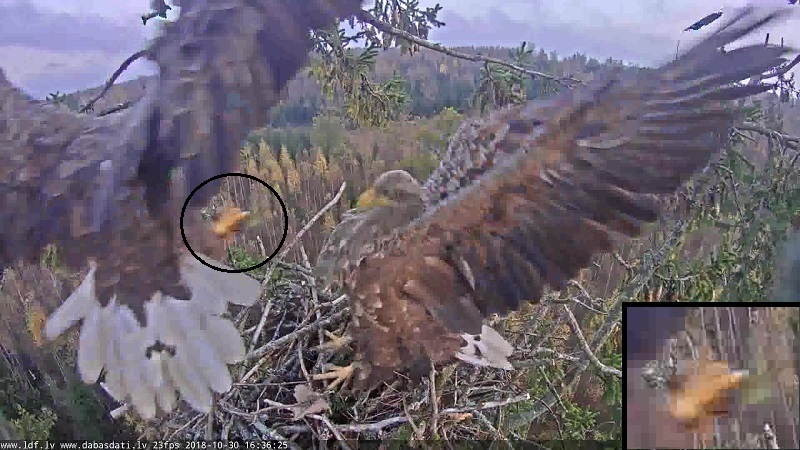 so also this eaglet was in its 2nd Calendar Year although he was very dark. the voices can stay in the video or you can cut them away, as you please. I left voices and cut out all emptiness. Still time is necessary to YouTube to process it. if your swans are silent your swans must be mute swans (Cygnus olor). Yes, our swans look as in the first photo. Perhaps, the beautiful girl is even more senior? this was a program of a dance company Luc Petton ja Le Guetteur. It is written: the program can't be shown in other countries. it was a program in Finnish TV. here's one short clip with the swans. first there are black swans and then a group of mute swans. they are still young so the black humps on their beaks are not very big yet. in the TV program they showed how the cygnets hatched and then were grown with the dancers from the very beginning. 13:11- 12 the camera worked for a bout a minute. 13:15 started again. i wonder if the camera is doing this all by itself or is someone doing something. 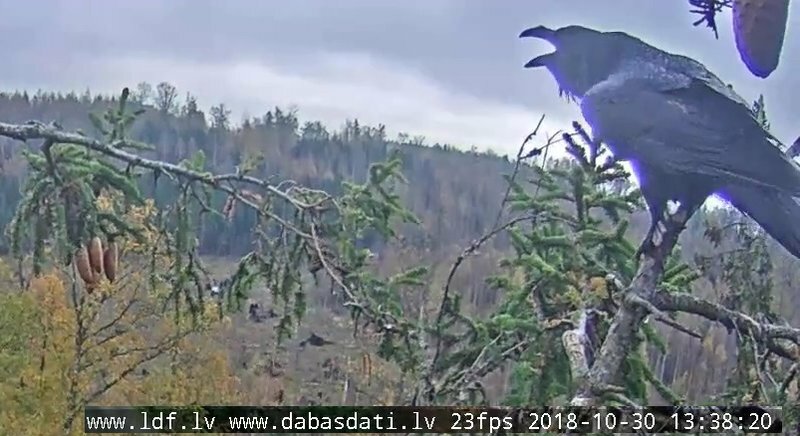 13:38 two ravens came to visit. 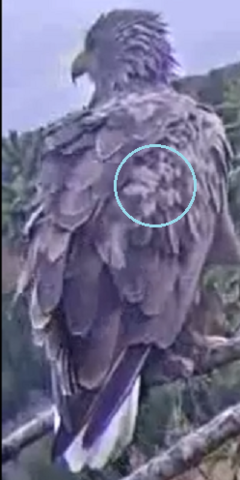 the second flew above the poop branch. the first called on the favourite branch of Raimis. There was an option to do this if there's no other msg after it. I tried, and it wasn't possible. Did they change it? At 16:06 hail and then snow. I have loaded video of the "first" snow (if it is). He has gone at 16:01, then a hail at 16:06 (but there is no record any more) and again snow. Only I see at Raymis a flower with five petals? ... Only I see at Raymis a flower with five petals? he should have the flower on his breast. i made clips of the ravens' visit. 13:38 ... the singing continued and the second raven arrived. then both flew away. What do they feed them, interestingly with? 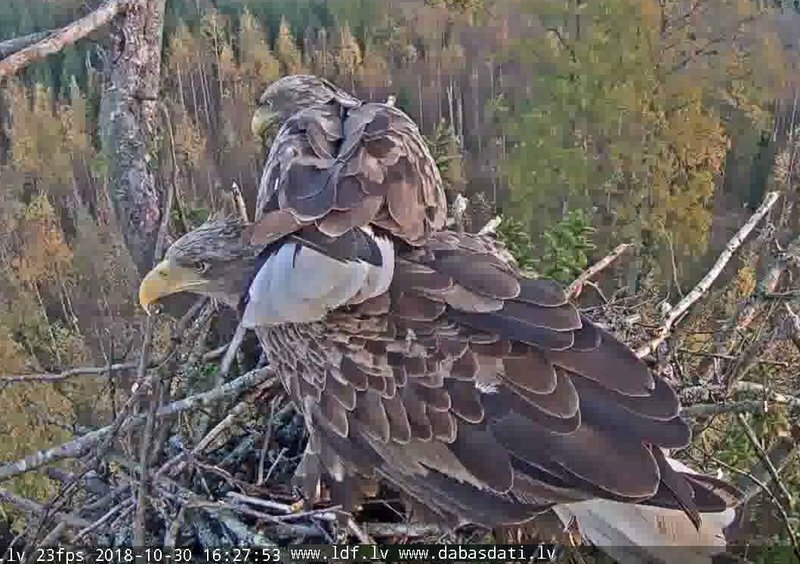 16:15 raven's voices... then Milda landed. ravens came with her. she was not pleased. 16:26 Raimis came with a stick. seeking shelter from the wind. 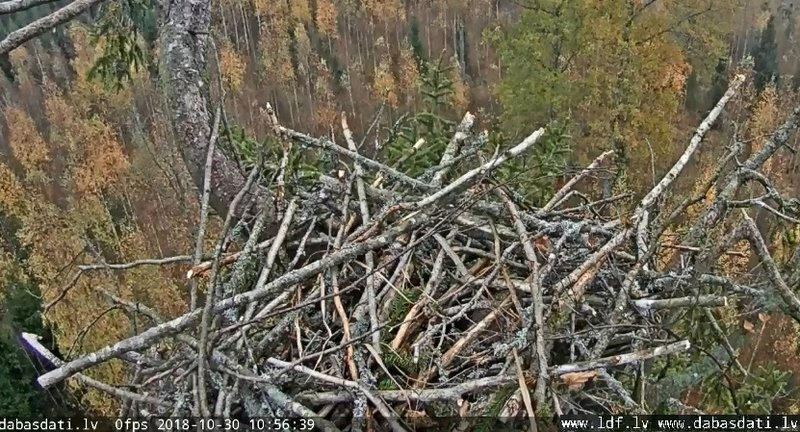 16:28 Milda jumped to the left branch. 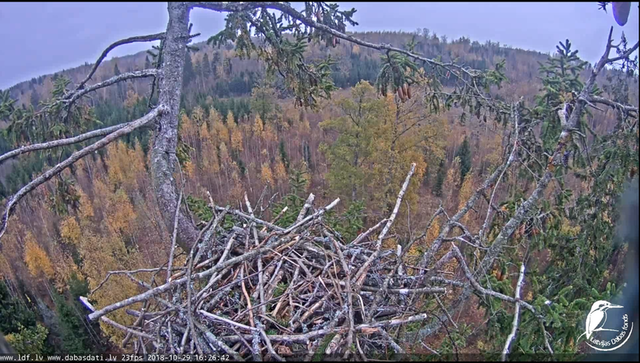 this is Raimis coming with the stick, stick dance, and Milda going to the branch. 16:36 she returned, with a something small. 16:38 Raimis called a few times. i think that he was in a loving mood. 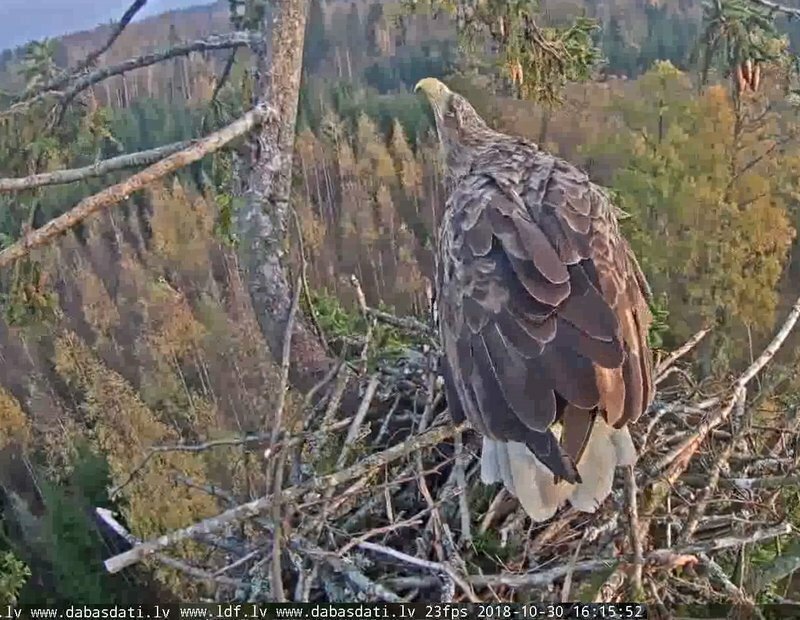 16:43 Milda jumped to the left branch. the wind is hard. 16:44 Milda flew out. Raimis followed her a few seconds later. 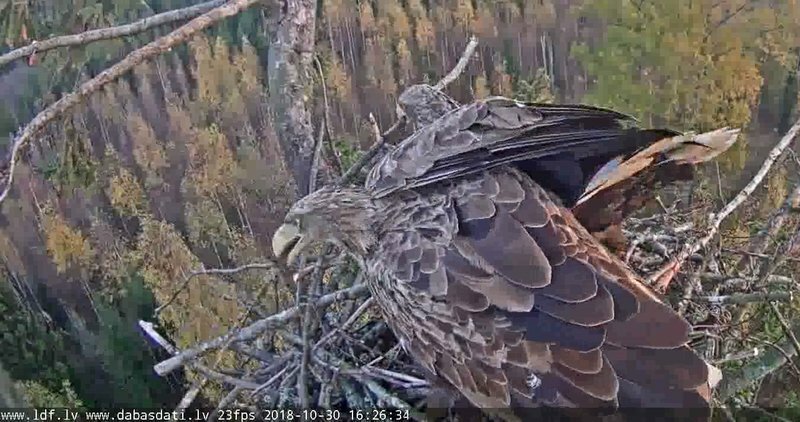 16:49 Raimis returned with a green twig. 16:55 Raimis looked up in the sky. i think i heard either raven's or crow's voices. the wind was hard.